Arab-American News publisher Osama Siblani rallied Muslim activists in Dearborn, Michigan yesterday, in an attempt to drum up support for ‘blasphemy laws’ that would fundamentally destroy the right of free speech in our country. The group claims that the laws are necessary so as not to hurt the “religious feelings of Muslims”. Not coincidentally, the group is clearly taking the lead of the Obama administration by calling for these laws in response to an anti-Muslim video – a video that only the administration has focused on, and a video we now know had absolutely nothing to do with the violence currently sweeping the Middle East. In fact, it is so apparent that this group is channeling the Obama administration, that they are quoting the now famous apology issued by the U.S. Embassy in Egypt, in which they too denounced ‘hurt(ing) the religious beliefs of others’. Led by a newspaper publisher, Muslim activists will call for putting limits on American free speech at a Dearborn rally this evening. You can’t make this stuff up. This assault on the First Amendment in the name of the prophet Mohammed is a sad day in America – and confirms fears that Muslim-American activists do not understand the fundamental separation of church and state in the American Constitution. “There is a need for deterrent legal measures against those individuals or groups that want to damage relations between people, spread hate and incite violence,” said Arab-American News publisher Osama Siblani, a self-proclaimed “moderate” who is apparently oblivious to how gutting the First Amendment would affect his own business. It is always astounding how people who protest alleged hate speech can’t ever seem to grasp the fact that the violence is always a more abhorrent action than the speech itself. They do not condemn protesters who burn our embassies. They do not rally against those who murder our diplomats. They simply and repeatedly condemn free speech. It is particularly ironic in this case, since a group of Muslims, also from Dearborn, Michigan, were filmed violently throwing bottles, stones, and anything else they could find at Christians this past summer. During the 2012 Arab International Festival held this past June in Dearborn, Michigan, a group of Christian evangelists were pelted with stones, bottles, and debris by Muslim youths while deputies from the Wayne County Sheriff’s Office stood idly by, allowing the criminal assault to take place. Many of the Christians were bloodied by the attack. When Ruben Israel, the leader of the Christian group, asked the law enforcement officers present to step in and enforce the criminal law so that the Christians could exercise their right to freedom of speech, Israel was given the option of either leaving the festival or facing arrest…. 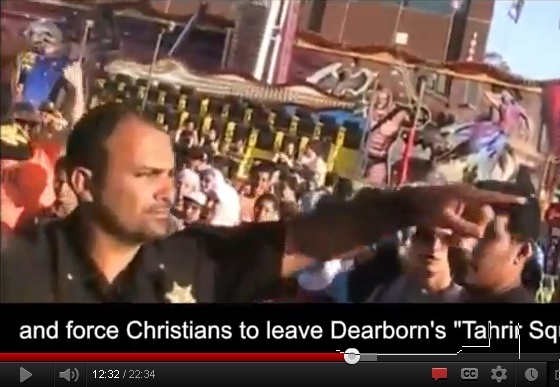 Dearborn is also the location where four Muslim football players beat a Christian quarterback during a football game. Throwing stones at Christians until they are bloodied? Check. Christians exercising their right to free speech in the United States of America are attacked. Our diplomats in the Middle East – murdered. And now, free speech is under assault. And the Obama administration is playing into all of it. The President should spend less time apologizing for America, and start apologizing too America.